The income gap in American cities has gotten a lot of attention, with stories in the New York Times and reports by the Brookings Institution and D.C. Fiscal Policy Institute focusing on this issue. This got us thinking about how D.C.’s tax system affects the city’s income gap. To what extent does the income tax system help close the gap? We looked at data from people filing income taxes in D.C. in 2011 to see how the local tax system affects residents’ incomes. We excluded from our analysis filers with no tax liability, since these filers generally report large losses, from either their businesses or rental properties. We also excluded part-time residents. 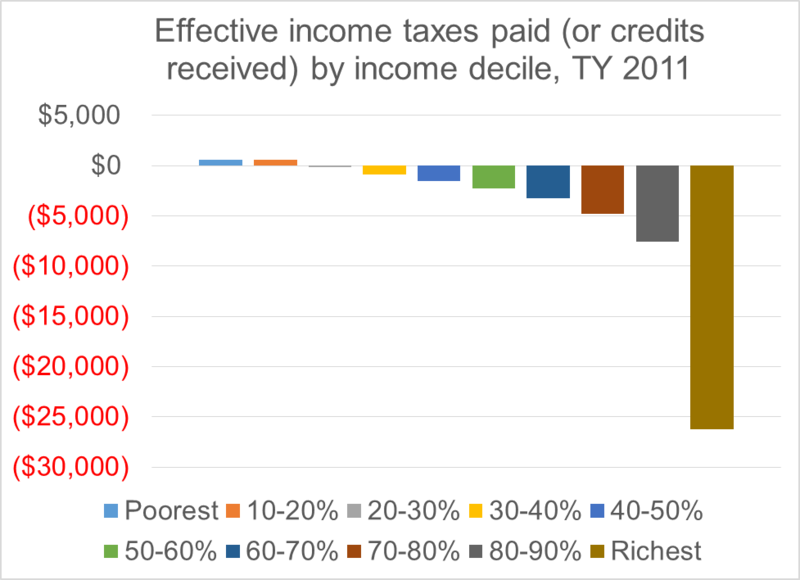 We found that people on the low end of the income distribution—the bottom two deciles, or tax filers with federal adjusted incomes under $15,600, on average–receive tax credits from the D.C. income tax system. Meanwhile those in the middle and upper income deciles see a decrease in income since they owe D.C income taxes. To calculate the income tax’s effect on an individual taxpayer we totaled any local income tax credits the taxpayer received (including EITC, the property tax credit, and other refundable credits) and subtracted local income taxes they owed. So, does the D.C. income tax system help close the city’s income gap? Yes. The gap in average income between the poorest and richest ten percent of residents is about $459,000 before taxes. After taxes it’s $432,000. That’s a reduction of $27,000, or about 6 percent. A roughly 6 percent reduction in the income gap might seem small, but D.C.’s income tax system is progressive—the percent of income paid towards taxes increases with income. In fact, D.C.’s income tax system is somewhat more progressive than the average of 51 cities across the country we studied in our 2012 Tax Rates and Tax Burdens report. Our report found that for a family with an income of $25,000, D.C.’s income tax burden is less than the 51-city average. For families at income levels of $50,000, $75,000, $100,000, and $150,000, the income tax burden is higher in D.C. than the 51-city average. To learn more about D.C.’s income gap and the tax system’s effect on it, read our D.C. Economic and Revenue Trends report for April 2014. In it we have a more in-depth analysis of taxes’ effect on income. Next > Contributions: who gives?